Small but mighty: driving a Yaris is a blast. It’s powerful and responsive enough to make it enjoyable behind the wheel and small enough to let you maneuver through traffic; you’ll forget if you're driving it for fun or because you need to. Looking around has never been easier. With the 360-degree view in the Yaris, every drive is a scenic drive. With an unexpectedly roomy 15.6 cu. 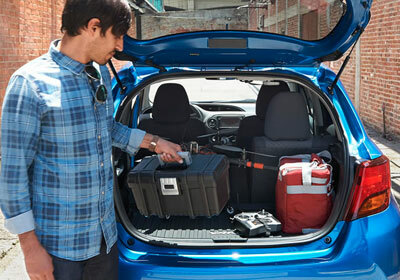 ft. of cargo space, Yaris 5-Door Liftback gives you the room you need to bring along the things you want. How big is your entourage? Don’t worry. Every Yaris can comfortably seat five, and with a choice of 3- or 5-door models, they can all have an easy way in and out. 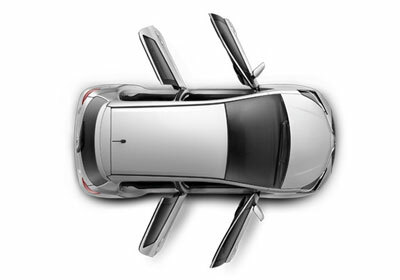 Its liftback door opens wide, which makes loading the cargo compartment a snap. So bring some friends, pack the fun and go. Good times are coming once you sit inside Yaris. Available white stitching on the seats grabs your attention, and available piano-black accents on the gearshift surround and steering wheel add an extra touch of class. And with Yaris Entune™ Audio with 6.1-in. touch-screen display, you’ve got plenty of tech to keep you informed. Tune in or press play on the standard 6-speaker, AM/FM CD player. And with standard HD Radio™, every Yaris delivers crisp, rich audio at no extra cost. Isn’t that music to your ears?